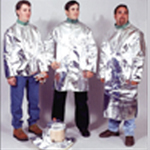 Stanco’s Aluminized Clothing line provides primary protection to workers exposed to molten metal splash, sparks and radiant heat. We have a variety of aluminized fabrics to offer, depending on work conditions and heat exposure, all provide: abrasion resistance, reflectiveness for extended periods of time, molten metal splash resistance, and generally greater protection. AR Aluminized PFR Rayon, 16oz. Good reflectivity & radiant heat protection, economical, low burn-through resistance. Constructed with set-in sleeves, concealed front snap closures with leather pull tabs. Full ragian and half ragian sleeves also available. Check with your Litton Service Representative. All are lock-stitched, Kevlar sewn and have a stand-up collar. Kevlar/P.B.I. Removable snap-out type liner made from 9 oz.. FR Green Cotton. Unit weight less then 2.5 lbs! Also made from APB, AK and ACK. 45” Coat, surgical style, open back, closed front, with sleeves. 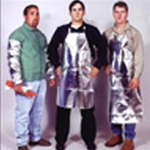 Bib Apron 24" x 30"
AR Aluminized PFR Rayon, 16oz. Good reflectivity & radiant heat protection, economical, low burn-through resistance. All solid construction (not pieced), leather ties and straps. Bib Apron 24" x 36"
Bib Apron 24" x 42"
Bib Apron 24" x 48"